Your team did a great job on the pool. It looks awesome. We appreciate the fact that you were easy to work with and did everything you said you would. Thanks Again. I love my Pool!!! My wife and I decided to go with Easy Living Pools for a number of reasons. After talking with four pool companies, it was a no brainer to go with Ron and Chris, the father and son duo running the business. They were easy to do business with, patient explaining all the choices and organized with great attention to detail. The pricing was the best of all the contractors for a far superior product. They are a One -Stop-Shop, they handled the entire project without a hitch. Great company to do business with. When people ask us about our pool, we send them to Easy Living Pools. There were several challenges, including delivery, which involved an ingenious method if tilting the pool to get it to our property. Rock excavation, there was MUCH more rock than anticipated.. Finally, Mother Nature, I’d be remiss if I left out the heavy rains the crew had to endure. Throughout it all, the team worked to deliver a gorgeous finished product, that we can’t wait to enjoy this summer!! Ron, Chris, Mark and their team did an excellent job installing our pool.. Rating 5 out of 5= Excellent!! "After researching three different In ground pool companies, we chose Easy Living Pools mainly because we liked the idea of working with a family owned and operated company, and we were impressed with their selection of fiberglass style pools. We were also appreciative of the time they took to walk us through the installation process and all that was involved. This is a large project, and we have had many done at our homes over the years. By far this was the smoothest large project we have been associated with. The Easy Living Team did a great job communicating with us throughout the project, and other than a few weather delays, the project unfolded exactly as described and within the overall timeline range that we agreed to. That itself is a big Wow! Lastly, we found the entire Easy Living Team to be flexible, responsive, and they truly exceeded our expectations and provided us with a fantastic pool and backyard environment. We would recommend and endorse Easy Living Pools to anyone thinking about putting in a pool in and would be happy to share our experience. we have lots of great pictures!" "Working with Ron was just like the name implies "easy". Ron and his son Chris run the company in a professional manner. Unlike most other pool companies in the Columbus area, they have been in business for many decades and Chris, Ron's son will insure that they will be around for many more to come! Being a successful business owner for 20 years + I know that he must be treating people fairly and doing business the right way, Putting customers first. Ron the owner is a pleasure to talk to and get to know, he has a lot of great ideas and knows how to work within a budget. Easy Living Pools is a full service in house company. They are very capable from planning to planting! We knew we found the right contractor the day we met Ron and excellent capable people at Easy Living Pools!" "My wife and I moved to Dublin three years ago to a house with no swimming pool. In our previous two homes, we had installed in-ground swimming pools. Therefore, we had a good understanding of the planning process and installation challenges that many first time pool owners may not fully understand. In our initial meeting with Easy Living Pools, Ron educated us on the pros and cons of fiberglass vs. liner pools and we decided to install our first fiberglass pool. From that point, we worked together seamlessly to design the pool and yard layout, equipment options and establish our pricing. As an engineer and project manager myself, I know that every project will have its problems, but it is important to work with the client to quickly address those issues. Once we signed the contract, Chris took over as the project manager and did an excellent job staying in communication throughout the permitting and installation process. This was one of the best pool installation experiences that we have been through and I would highly recommend Easy Living Pools as your pool contractor." "Ron and I have been associated for over 30 years. His company installed our pool . All Jobs were done in a proficient and work like manner. I would highly recommend Ron’s company for any work you need." "We decided to go with Easy Living Pools because they provided the entire pool package: pool, decking, landscape, fence. We couldn't be happier with the finished product! Ron really listened to what we wanted and came up with a plan that incorporated everything. Everyone that worked on the project was completely friendly and professional. They where easy to work with, walked us through the closing/opening process for the pool season, and answered all of our questions-even after the project we completed." "We enjoyed working with the team at Easy Living Pools, from start to finish. They were very responsive when we had questions or wanted to talk through issues. They made good suggestions and proposed alternatives when we weren't sure the direction we wanted to go. We trust them -- which says a lot -- and have referred friends of ours, who are considering a pool, to them." "We Love Our Pool and Outdoor Living space! 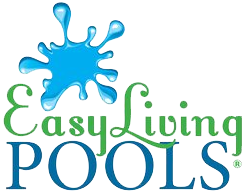 Easy Living Pools delivered everything we had hoped for and more. We had spoken to several service providers prior to landing with you and we clearly made the right choice. Walking us through each step of the process made it easy and virtually stress free. Customer focused and extreme flexibility on real time changes Attention to detail!! Needless to say we are very impressed with the final result. Thank You! You are professionals that truly understand what service is about. As the old saying goes - "You get what you pay for!" We are extremely happy with what we paid. Service, Quality, Cost; the perfect trio…"